Hello! 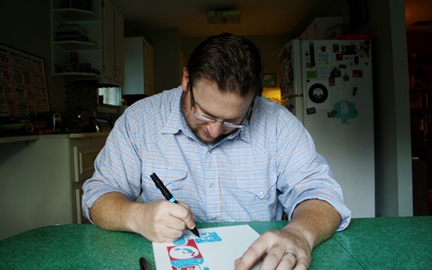 I'm a freelance illustrator, print maker, husband, and father working and living in Austin, Texas. I've been drawing as long as I can remember. I used to rush through taking my tests in elementary school so I could have extra time to flip the paper over and use the whole blank part of the sheet to draw pictures. My parents would occasionally buy me Thrasher magazine and I was less interested in skateboarding as I was in redrawing all of the old decks and graphics. I would practice drawing anything I could get my hands on: Garbage Pail Kids, Mad Magazine covers, Disney cartoons, album covers, my classmates. All of the these things helped build a visual vocabulary that shapes my artwork today. Voyage Houston asked me a few questions about my process and inspiration. You can find that interview here.